As our world continues to move at a frantic pace the amount of stress we live with grows in intensity. It slithers up on us without us knowing of its existance, inserts itself, and becomes something that we figure is common and "normal" for our lives. It then sets the stage for our disease, saping our energy, and becomes a permanent discomfort. It not only dramatically affects ourselves but also affects our loved-ones, and their stress even affects us. Stress Healing and Mastery training is a whole-body experiential training system that is designed to help you control all this..... Your nervous system's response to stress. My introductory 3-session Stress Reduction System is designed to help identify the reasons that are behind your inability to be at ease and at peace inside; providing you with skills, directions, and solutions. Then I give you the deep experience of actually being stress-free that you can take with you. I've designed this system specifically for high-performance. It helps you to find your way into the "zone" and learn how to take advantage of that state; releasing deep - uncomfortable tensions, while keeping your body and mind highly focused. So you can find poise, ease, self-centering strength, and harmony. Experience what ease is truly like. Session 1 drops you into your body to feel what's actually going on and where stress may be hiding. I'll teach you how to breathe correctly and how to begin to release those areas while discovering soft movement. You will reinforce these techniques and gain more advanced abilities before leaving and use them in preparation for session 2. Session 1 opens the mind to the body. Session 2 addresses the accumulation of tension stored in the body's muscle systems. Using a progression of assisted stretch and release processes I provide experiential training by which you actively learn how to unravel muscular tension. I provide you with a series of simple to understand dynamic exercises that form the core of human movement. Immediate benefits include relief from aches and pains, increase in overall physical energy, and an emotional unburdening and feeling of greater freedom. Through this you will learn how to take a stress-reducing practice into your daily routine. Session 3 is its own system of learning. Here I'll help you to understand true maintenance and integration. I'll teach you how to infuse this into your daily life and keep it there, helping to add more and more physical and mental health into every single day. 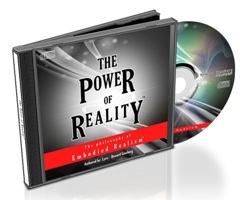 This holistic system accelerates your ability to be both at ease and effective at the same time; improving your performance and abilities while giving you the option to tune down as well. If you know you are stressed please don't put this off any longer. The most common, biggest mistake stressed-out people make is waiting..... until its too late. The ease of turning off your mind is only moments away. 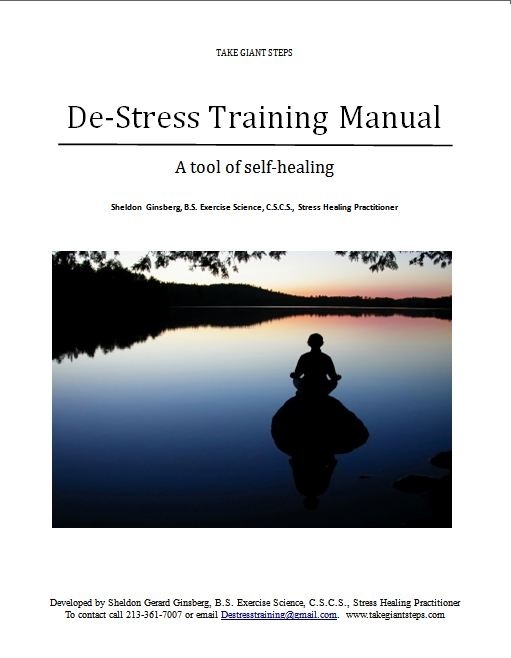 This training manual helps you to create a structured De-Stress Training program based upon the 20 minute experience found within the CD. The more you use the CD the better you get at remaining calm throughout your day.